On May 18, 1980, Mt. 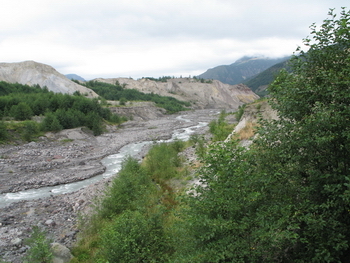 St. Helens erupted violently, turning a forest full of life into a barren, destroyed landscape. During the past decades, a new ecosystem has been evolving in which flora and fauna now flourish. Two visitor centers, Coldwater Ridge and Johnston Ridge, have been built to educate people about this unique area. Wildlife and wildflowers can be seen from pull-outs and from parking lots, and for the person who wants to explore a little more, a network of hiking trails have been created through various habitats. The habitat is primarily open areas with some shrubs, and it can be quite windy at times. Small ponds in the hummocks create wetlands that provide water for wildlife and an oasis for dragonflies. Red alders dominate the riparian areas where water is plentiful. Young stands of firs have begun to rebuild the forest, especially in the lower-elevation areas. At elevations that range from 2,500 feet to 4,200 feet, these combined habitats create an ecosystem that now teems with life. These habitats are found near the visitor centers. There are many species of birds and other wildlife that use the monument for breeding. A few of the common bird species seen regularly during the summer months are: Barrow's Goldeneye, American Kestrel, Osprey, Sora, Spotted Sandpiper, Wilson's Snipe, Common Nighthawk, Willow Flycatcher, Warbling Vireo, Barn Swallow, Northern Roughed-winged Swallow, American Pipit, White-crowned Sparrow, Savannah Sparrow, Dark-eyed Junco, Red-winged Blackbird, and various warbler species. Blue Grouse and Raven are resident birds and local breeders in the area. Golden Eagle, Prairie Falcon, and Horned Larks are seen occasionally. Baird's Sandpipers migrate through during the fall, as do raptors. With a little searching, you can see large herds of elk grazing and resting on the hillsides. Wildflowers are numerous throughout and are visited by various species of butterflies. From I-5, take Exit #49 (Castle Rock) and follow Route 504 east. The highway ends in 52 miles at Johnston Ridge, which has a commanding view of the mountain and blast zone. Both visitor centers are open from May to October, and have a $3 entrance fee for each. The best time to visit is from the beginning of June to the end of September. Late June through mid-August is the peak time for wildflowers, butterflies, and dragonflies. (For a list of native plants of the area, see References below.) The Coldwater Ridge Visitor Center overlooks Coldwater Lake, and is the only center that has a snack bar with hot food. In about 45.5 miles, look for a parking lot on the right. There is a 2.5-mile moderate trail that loops through the hummocks. This area offers diverse habitats for the best birding. In less than .5 miles down the road, look for another small parking lot on the left. This is the Coldwater Ridge trailhead. A slightly more strenuous trail leads you up to the ridge, where the wildflowers and butterflies are at their best.